Veenapani Chawla has long been engaged in creating a unique from of performance methodology. A self-taught artist, she has evolved a new language of theatrical practice that fuses traditional and modern aspects of life and theatre. 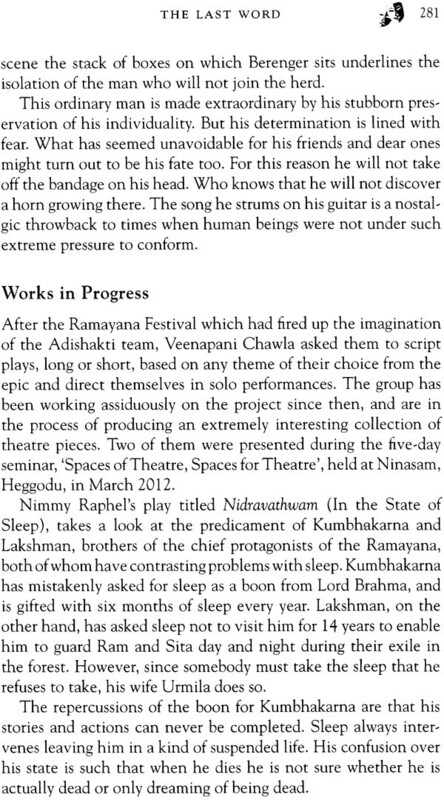 Tracing Veenapani Chawla’s journey from her schooldays, where she was encouraged to move beyond academics and develop an interest in music and dramatics, to her early plays in Mumbai, this volume goes on to explore her deepening relationship with theatre culminating in the founding of Adishakti Laboratory for Theatre Arts and Research in Puducherry. Veenapani Chawla’s belief in plurality has helped her move beyond earlier notions of what theatre should be and demonstrate what theatre could be. Capturing the multidimensional aspects of her work, this book bring together a wide range of writing—essays, reviews, interviews, and performance texts, as well as papers by the artist herself. Accompanied by a DVD of her most complex play till date, The Hare and the Tortoise, this work offers insights into the artist’s creative process and her oeuvre. Shanta Gokhale, a well-known bilingual writer, novelist, translator, journalist, and theatre critic, was formerly associated with The Times of India (Mumbai) as the Arts Editor. She has written scripts for several films, including the national award winning documentary Narayan Gangaram Surve. Veenapani Chawla's theatre is interesting and intriguing not because it is avant garde but because, instead of either deliberately eschewing tradition or exploiting it from ulterior motives, as is the case in most such theatres where tradition plays a pivotal role, either by its deliberate absence or by its too facile 'interpretation', it glories in tradition, peeling away its superfluities and laying bare its strengths. 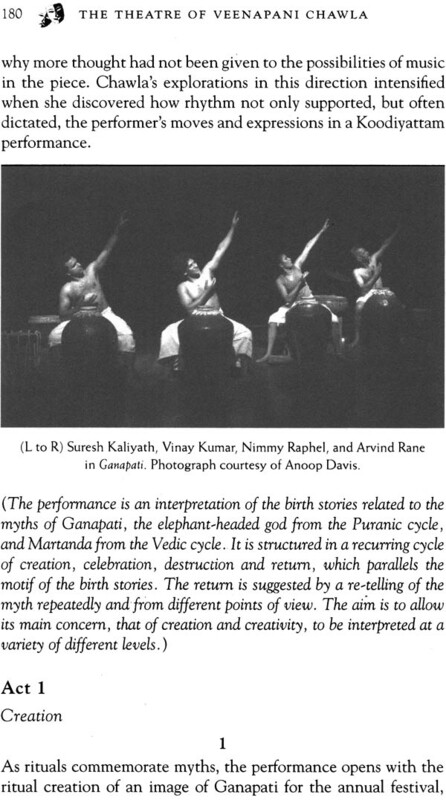 It requires a modern perspective of life and theatre along with a deep respect for the old to be able to create a true fusion between the modern and the traditional. A genuinely creative vision unfailingly imbibes the vitality of a tradition and marries it to modernity to give the resulting work its spine. 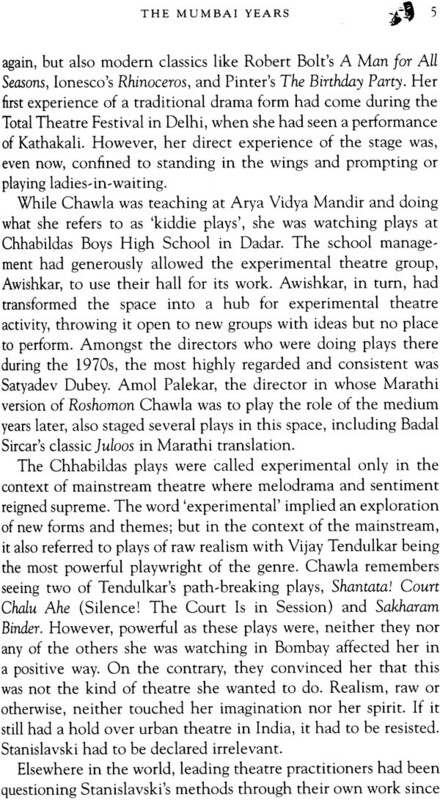 Although I have not been able to see all of Chawla's productions, I have seen some of her major ones and realized that her work in theatre has been a continuous journey from one point to the next. She has travelled a great distance from Oedipus to her latest play, the journey being at once a search for the deepest meaning of theatre and an almost religious probe into the mystique of it. That makes every new work of hers a work in progress that points to the unfolding of yet another vista in the next work. It is a journey that never ends. It could go on for ever. There will never be anything like the ultimate truth, nothing like the final arrival at a destination. An artist who embarks on such a quest has no alternative but to continue trudging on. For how long s/he can do it depends on how much steam and how much patience s/he has, and also on how deep her/his desire to know is. This is one of the reasons why nobody, least of all I, should attempt to talk about any single work of hers independently of the others. 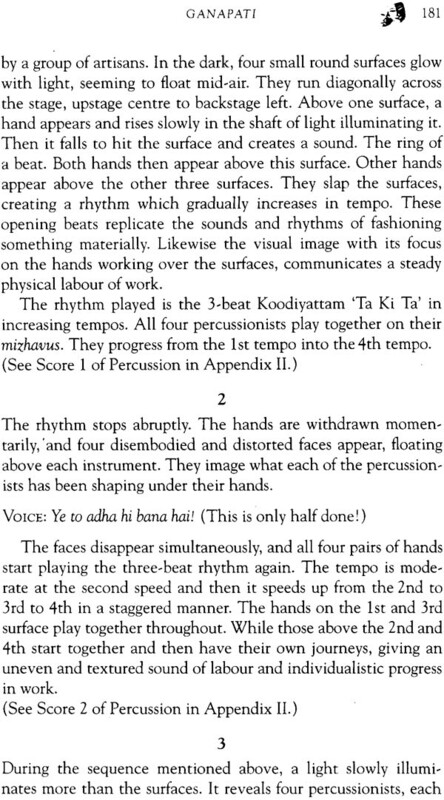 It would be unfair to single out a production for analysis when every play is just another step, leading her and us to something still unexplored from the indefinable territory of human experience. When you talk about Veenapani Chawla, you have to talk about her oeuvre. Veenapani Chawla's theatre is perhaps the most traditional theatre in India if the meaning of tradition is understood correctly. She manages to cut off all the dead wood accumulated over centuries and tries to reach the never-changing dynamic vital core of it, internalizing and expressing it in a newly forged idiom which is uniquely her own. Tradition is different from custom or convention or norms. Over a period, conventions become redundant, customs obsolete, norms die. Tradition must not be confused with them. Tradition springs from and is deeply embedded in the spiritual life of a people. It influences a whole way of living and thinking of a particular community for infinity. The very fabric of a community's life is shot through with it. It is invisible yet pulsates ceaselessly, giving it a unique riverness. It may change its face over time, accumulating much that is undesirable. The next generation has to learn to discard this and rediscover its core, that which has remained intact through the centuries, and draw sustenance from it. What Chawla is doing and what she is discovering in the process is not exactly new. 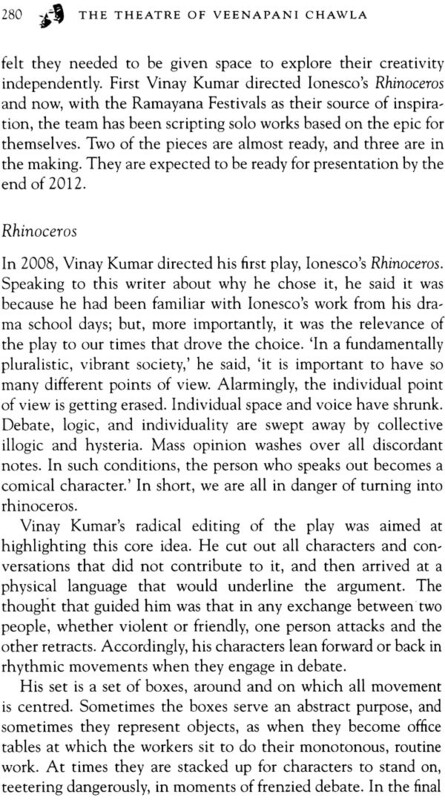 The supremacy of the actor in theatre and the hard regimen required of him is something Grotowski has talked about and practised much before her. He has also made eclectic use of many Oriental traditions in training his actors. 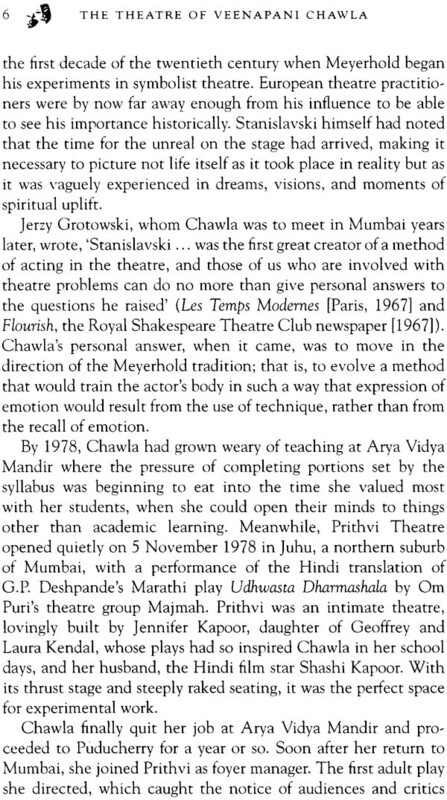 Shanta tells us that Chawla's response to Grotowski was lukewarm. What makes her different is, according to Shanta, her deep knowledge and practice of Sri Aurobindo's philosophy. Not being a student of this philosophy, I am not in a position to assess the validity of this observation. 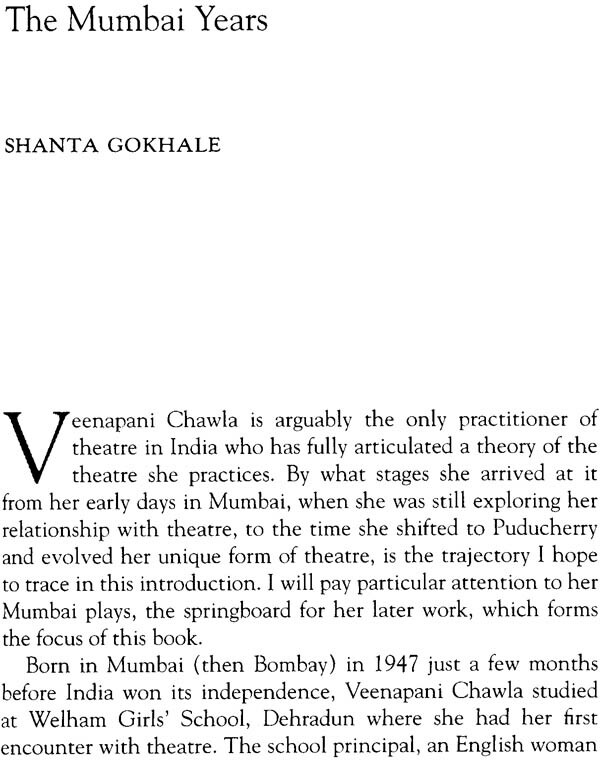 Shanta, who is usually impatient with and suspicious of anything even remotely 'mystical or spiritual', seems to have surrendered herself to Chawla's position as stated clearly in her interview with Leela Gandhi and her paper 'Space and the Actor'. 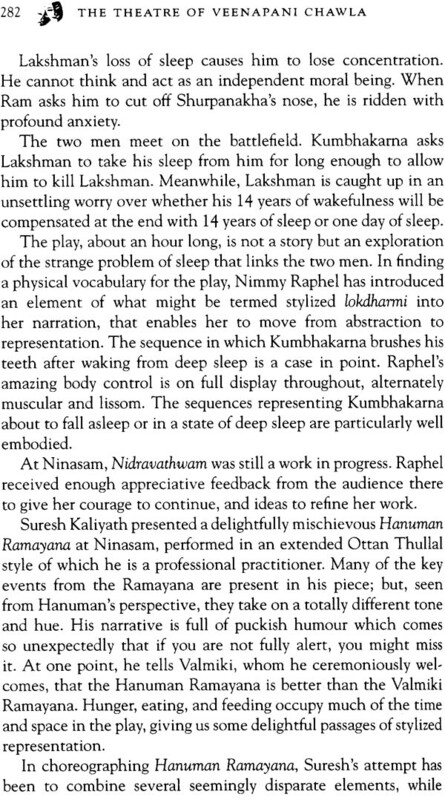 But if we get any illuminating moment in her theatre, and we certainly do, it is definitely not because of her 'spiritual' approach. We get it because of the innate theatricality of her work. A work of art acquires a spiritual luminosity not because of its stated 'spiritual' content or the spiritual approach of the creator, but because of an unrelenting search, boundless suffering, profoundest compassion, all inherent within it. 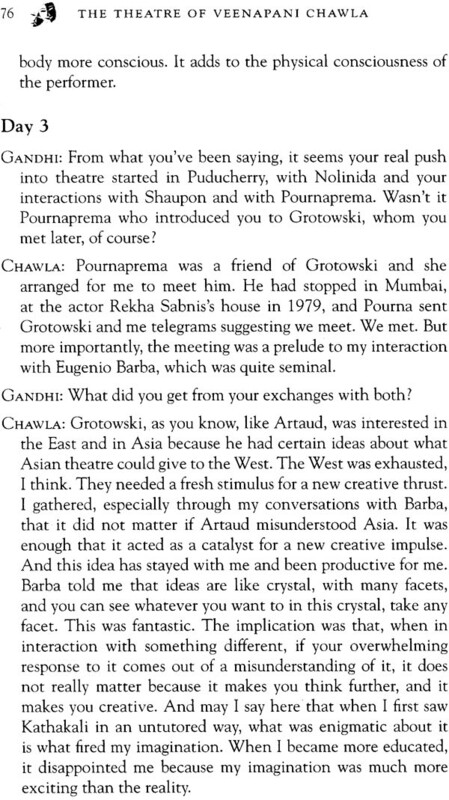 Chawla also speaks of Grotowski's 'self-crucifying asceticism' and 'cruelty to body' as being different from Sri Aurobindo's position, Ascetic he was, but there was no self-crucifixion of any kind in his theatre, nor cruelty to the body if I have understood my Grotowski well. 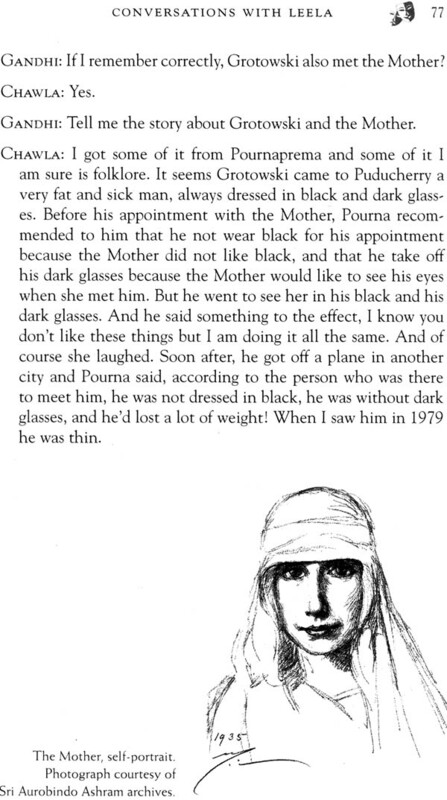 That kind of cruelty belongs to Artaud. 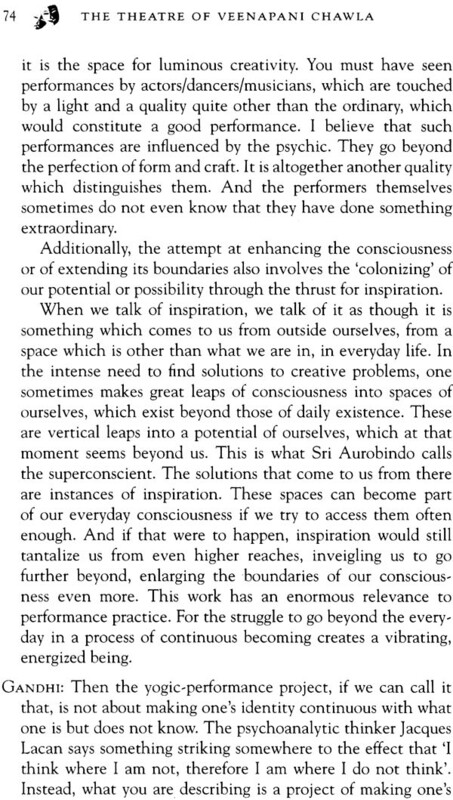 Grotowski may not have used the word 'sadhak' in relation to his actor, but that is exactly what he trained his actor to be, to fine-tune his body to arrive at a spiritual experience. Negating everything redundant, materially or artistically, is not necessarily cruelty to the body; it is the very meaning of Grotowski's asceticism. His idea of sacrifice is misinterpreted by Shanta. His actor's sacrifice consists in stripping of his self and laying bare his innermost core to the audience. This involves annihilation of ahankaar, the ego. This sounds familiar, doesn't it? Where is the difference? That is exactly what Indian spiritual traditions advocate if you are on that path. 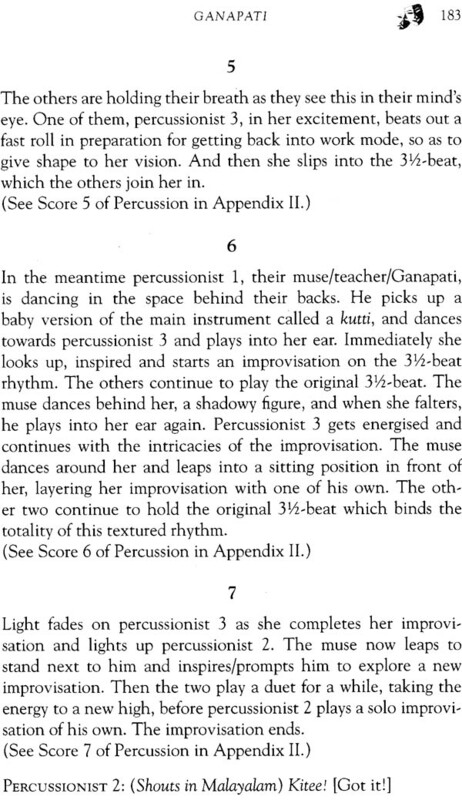 And although I shall accept the fact that Chawla has not borrowed from Grotowski, I must maintain that borrowing is always better than being influenced. Robbing is best. It is a conscious choice. You take what is necessary for your growth, spiritual as well as artistic, from anybody, anywhere. Everybody does it. 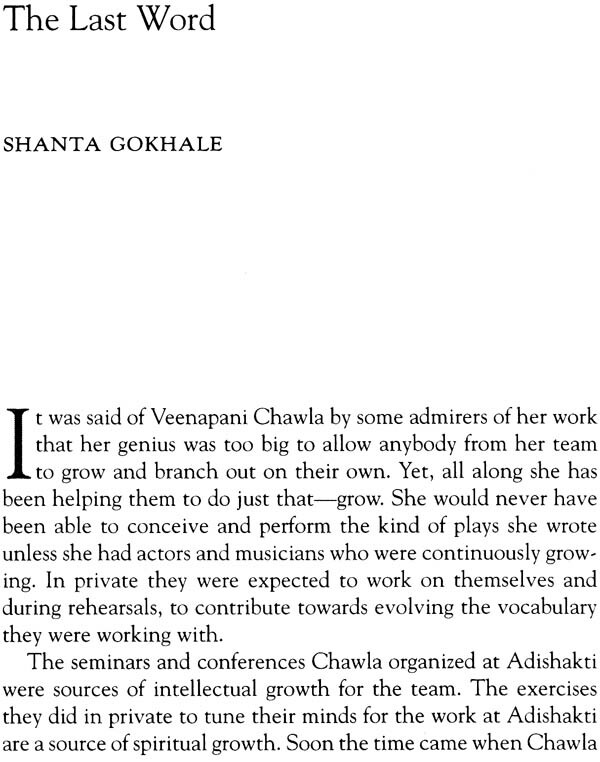 What I find fascinating in Chawla is that she has toiled and failed and worked undaunted and arrived at certain deliberations (which may change with the passage of time) on her own, and if there are similarities to be found between Grotowski's ideas and hers, they must be superficial and accidental (if we decide to go by Shanta's observations) because there are many dissimilarities as well. This might serve as a good topic for PhD thesis. 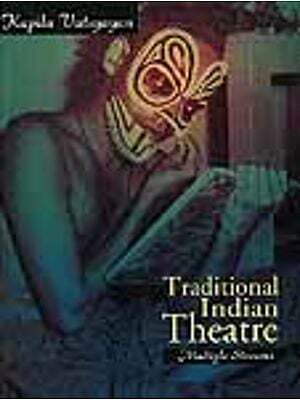 I have already said that to assess Chawla's work one cannot treat anyone of her plays in isolation. They are all interlinked. Her entire work is thus one whole unit, a record of an artist's probe and growth. 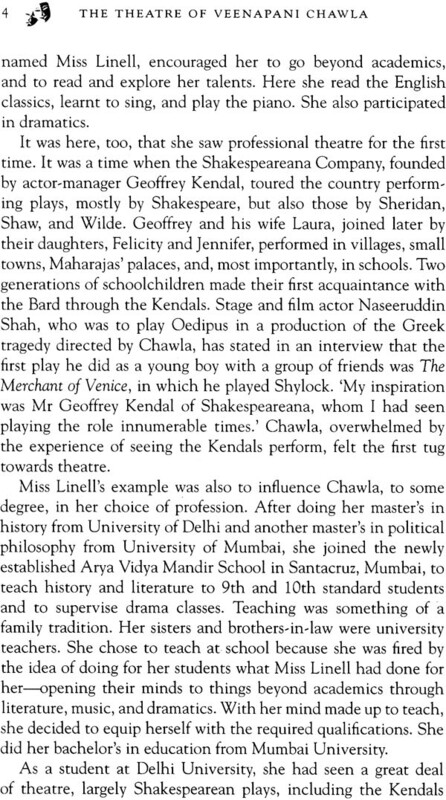 It is against this background that Shanta Gokhale's book on Veenapani Chawla's theatre is most welcome because that is exactly what the book tries to do. 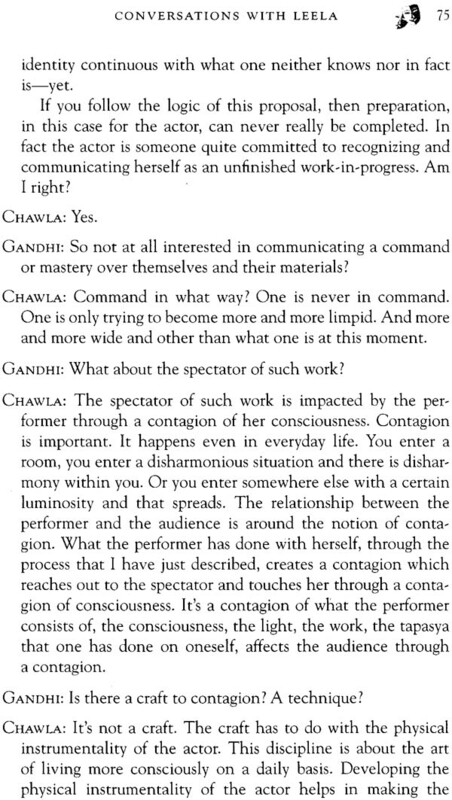 One does not hear a solo voice here, defining Chawla's theatre conclusively, but many voices, each with their own approach to Chawla's working methodology and her theatre, leaving the reader to draw her/his own conclusions. There are articles, interviews, and press reviews here that throw light on areas which perhaps one person might not have been able to cover. 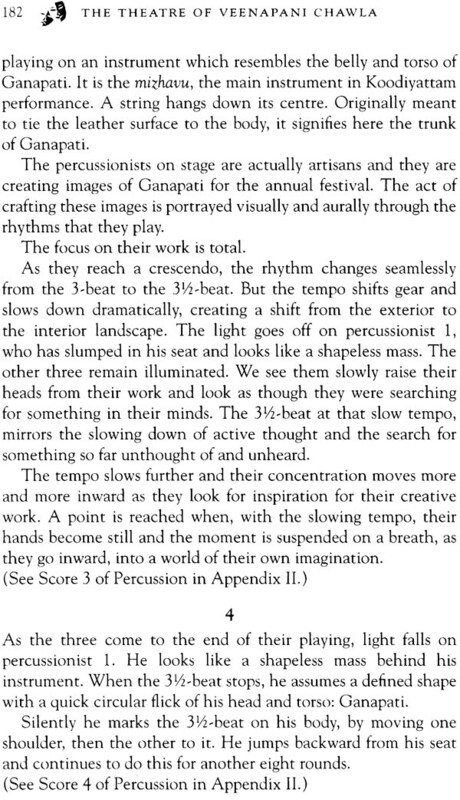 Shanta, who has been a sympathetic witness to Chawla's long and arduous journey, has not only documented it beautifully, but also managed to throw light on Chawla's creative impulses. This attempt to share an artist's journey into the interior is a rare event in dramatic criticism.